The blade uses Uddeholm’s special alloy steel from Sweden. Dimples are formed to ensure the sharpness needed to cut food. And this handle is so great ingredient. Bladesmith uses desert ironwood for the handmade handle. What is “desert Ironwood”? Desert ironwood comes from the Southwestern deserts of the United States. Being in sand for a long time, the inner part of the wood has almost hardened into stone with a very high density, beautiful brilliance, and unique luster. 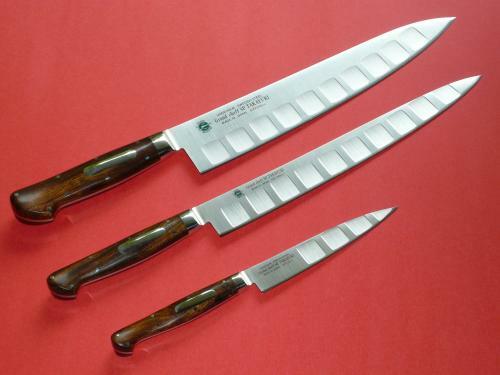 Called the King of Wood because of its value, the wood is used for high-quality handmade knives throughout the world. The handle is designed with a beautiful curve, and once you grip it, you will experience an excitement that you have never felt before.